Riding your bike in exotic places or at a cool bike park is part of the exciting world of mountain biking and you should absolutely do it. At the very least a trail centre visit should be on your agenda at some point, and experience a well crafted and hopefully well maintained mountain bike trail with challenging features in a controlled environment. Also trailblazing in a foreign country under the watchful eye of an experienced and knowledgeable guide is as good as it can get in my opinion. However, you should not forget your own “back garden”. A ride from your own door without the hassle and faff of packing up a car, worrying about parking or fuel, is hugely satisfying and doing it with your mates is great fun. It doesn’t matter where you live, even the most densely populated and built up city will have a trail or a park somewhere you can spin your legs without having to pack up that car. I’m pretty lucky in Wiltshire (not as lucky as some though) as I can leave my house and within 10-15 minutes I can climb a local hill and be out of the town, away from the traffic and enjoying some single track, a few cheeky descents and miles of rolling hills and forests. While out riding I regularly bump into small groups of other riders from my area, mostly riding the same trails and routes on a weekly basis. I decided it was time to try and pull together the local knowledge of known and less known trails and routes and start a Facebook Group. 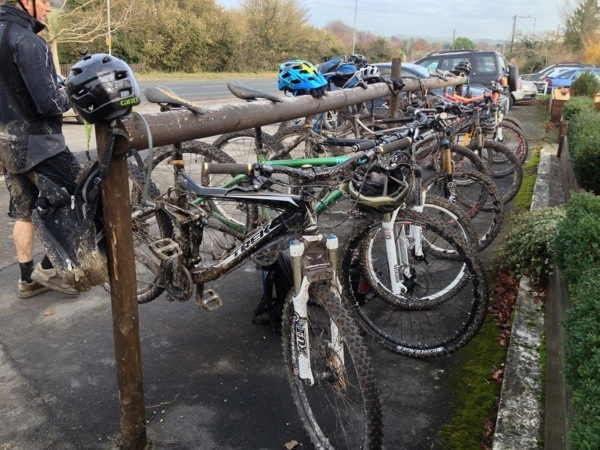 Last week 10 of us rode a 30km loop on our Calne MTB inaugural ride. Most riders knew the route and trails but it was good to meet some new faces and have a bit of a social. Calne MTB now has around 40 members and this Sunday we are heading out on our second group ride. I have planned a route that could very well find us knee deep in mud but it will be great fun to lead a ride again and hopefully show some of the local guys somewhere new and interesting to ride.